Yesterday's DOJ audit focused upon the Adams County Correctional Center, a federal prison for immigrants operated by CoreCivic, the company formerly called Correction Corporation of America. Four years ago, an inmate riot at the Mississippi prison left a guard dead and 20 people injured. DOJ's inspector general said in the audit that it is “deeply concerned” that the Adams facility remains “plagued by the same significant deficiencies” that sparked the riot. A detainee makes a phone call at California's Adelanto Detention Facility, an ICE facility managed by the GEO Group. The audit directly echoes the findings of a multi-part investigation released earlier this year in The Nation, in partnership with the Investigative Fund, that uncovered vast failures in the Adams County prison and 10 other privately operated federal prisons used to incarcerate non-citizens convicted of crimes. The investigation found that CCA had failed for years to correct deficiencies in the provision of medical care. Inmates died as a result. Federal monitoring reports that The Nation obtained through a federal open records lawsuit revealed that Bureau of Prisons monitors documented 34 inmate deaths following shoddy care in privately run federal prisons between January 2007 and June 2015. 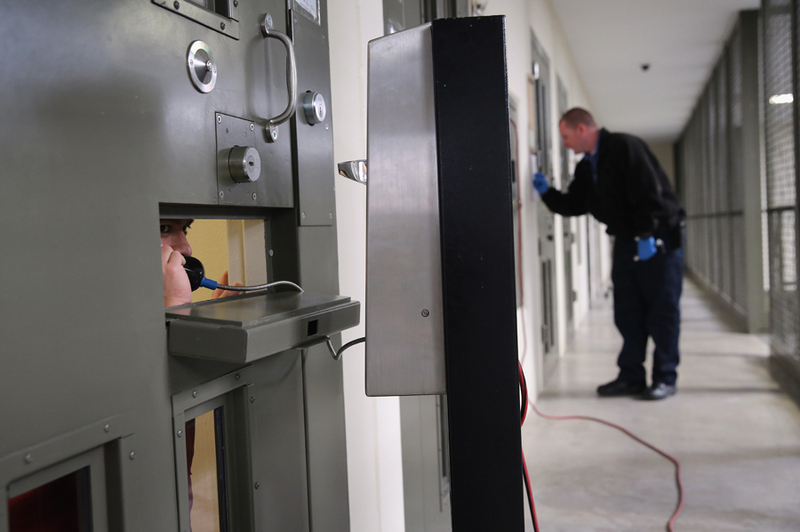 Fourteen of these deaths occurred in prisons run by CCA, including at least seven in Adams. In August, just over two months after the release of The Nation investigation, the Department of Justice ordered the Bureau of Prisons to begin a process of ending entirely its use of private prisons. The order also followed an inspector general's report that concluded privately run prisons overall were less safe and no less costly than those operated by the federal government. The DOJ ordered the federal private prison system to shrink from 22,000 to roughly 14,000 people by May 2017, and in five years the total private federal prison population was to reach zero. Immediately after the August order, both CCA and the Geo Group, two of the country's largest private prison firms, lost more than 40 percent of their market value. Then came the election of Donald Trump. The prison company stocks rallied. Trump's cast of advisors and presumptive appointees include advocates for prison privatization, including Senator Jeff Sessions, who Trump will nominate to become the attorney general. Sessions could simply reverse the DOJ's August order. The Adams County prison, which is the third most costly Justice Department contract of any kind since 2009, has been problem-prone since it opened in 2009 in Natchez, Mississippi. The Nationinvestigation documented that immediately after it opened, federal monitors began to find serious failures by CCA to operate in line with contractual requirements. The prisons' workers were undertrained, and did not speak Spanish even though the majority of Adams inmates were Mexican nationals. The prison medical units were understaffed and medical workers with limited training were often asked to handle complicated tasks that were beyond their scope of practice. Prisoners suffered long and critical delays in care. The Justice Department's inspector general, in the investigation released yesterday, made similar findings. “The staffing levels at the Adams County facility were frequently insufficient during the four years we tested, even though systemic staffing deficiencies were cited as a contributing factor to the riot,” the report said. Specific medical follow-up was not performed, the report found, even when the government warned CCA to correct a problem. Four years after the riot, the prison still employed only four Spanish-speaking workers, out of a staff of several hundred, and for months on end only one doctor was employed by CCA to care for over 2,000 inmates. The Justice Department watchdogs also concluded that the Bureau of Prisons' oversight mechanisms were not strong enough to force CCA compliance, and the contractual terms were often too thin or remained unmodified despite recommendations from government monitors and review committees. The inspector general issued a similar report in April 2015 about the Reeves County Correctional Center, a Geo Group-run private federal prison in west Texas. That riot at Willacy was similar to one that rocked Adams County in 2012, where unrest left a 24-year-old prison guard dead after rioting inmates climbed to the roof where the guard was stationed and beat him. In the aftermath of the riot at Adams, as The Nation and The Investigative Fund reported in June, federal prison monitors and prison contracting officials in Washington pressed the Bureau of Prisons brass to end the contract with CCA. The Beltway officials refused, instead renewing its contact with CCA in 2013. The contract was renewed once again in 2015, an extension that ends in 2017, when the BOP has the option walk away from the Adams facility or sign yet another extension. This post was published by The Nation and was reported in partnership with The Investigative Fund at The Nation Institute, now known as Type Investigations.